Find hotel near Centro Regional De Artesa .. 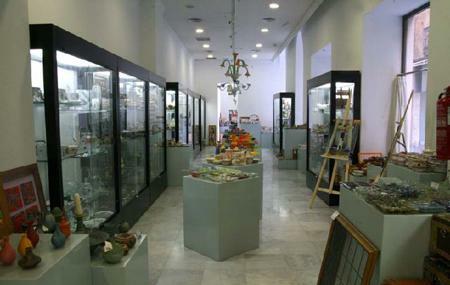 Encouraging local artisans and providing a platform for selling their handicrafts, Centro Regional de Artesania has on sale arts and handicrafts created by local craftsmen (from the Murcia region). Shop at this store and take back beautiful and unique souvenirs for your loved ones. How popular is Centro Regional De Artesania? People normally club together Roman Theatre Museum and Palacio Consistorial De Cartagena while planning their visit to Centro Regional De Artesania. People also prefer to end their day with Centro Regional De Artesania. A wide variety of local wares, from honey to jewelry to ceramics. Many unique pieces at fair prices, and it feels good to be supporting the artisans directly. We went back more than once on a single trip. Worth the visit! Great store for local craft jewlery and much more. 100% of all proceeds go directly to the artist. I think the store is government funded so it makes no profit off sales. Great merchandise at excellent prices. Friendly merchant. Provides a lot of information not only about the craftsmanship in the shop, but also the city and restaurants. There are a lot of nice pieces in the store. Definitely recommend. Great service from Antonio and a stunning piece of fused art, taken back to the UK for a special birthday present. Thank you. Schönes Konzept mit interessantem Kunsthandwerk. Service leider zurückhaltend. Trotzdem gut.